Distinguishing between Maximian, Galerius, and Maximinus II. Their legends can be very similar. Both Maximian and Galerius used "MAXIMIANVS" in their legends. 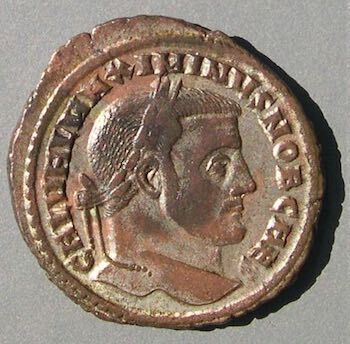 The coin to the right is of Galerius even though it says "MAXIMIANVS". Read on to understand why. Maximinus II used "MAXIMINVS", which differs by only one easy-to-overlook letter. Maximian (= Maximianus, abbreviated for English like "Marcus" Antony becomes "Mark") was Augustus 286-305 (with a second reign 306-308 in the west). Galerius was Caesar 293-305 and Augustus 305-311. Galerius Valerius Maximinus, which is not much different, lacking only the second "A" in "MAXIMIANVS". So, how do we tell their coins apart? This is not trivial. Details matter. MAXIMINVS (uniquely determines Maximinus II, but it can be hard to notice the difference in a long legend when all the rest is identical). Advice 2: Read carefully enough to distinguish between "MAXIMIANVS" and "MAXIMINVS." Rule 2: MAXIMIANVS with CAES identifies Galerius. Rule 3: MAXIMIANVS with GAL identifies Galerius. 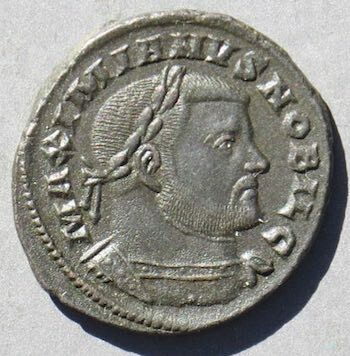 Example of Rule 1: MAXIMINVS always identifies Maximinus II. MAXIMINVS makes it Maximinus II. Example of Rule 2: MAXIMIANVS with CAES identifies Galerius. This is a coin of Galerius. Recall Advice 1: Don't assume "MAXIMIANVS" identifies Maximian. All coins of Maximian have the title "Augustus," so this coin can't be of Maximian. 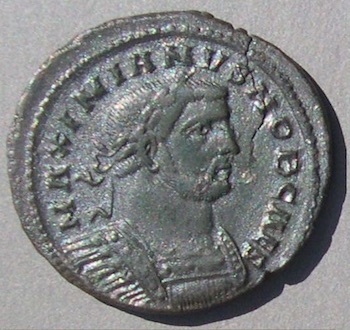 However, Galerius also issued coins as Augustus, so "MAXIMIANVS" and AVG" do not assure the coin is of Maximian. See the next coin. Example of Rule 3: MAXIMIANVS with GAL identifies Galerius. Galerius had "Galerius" as part of his name and Maximian did not. 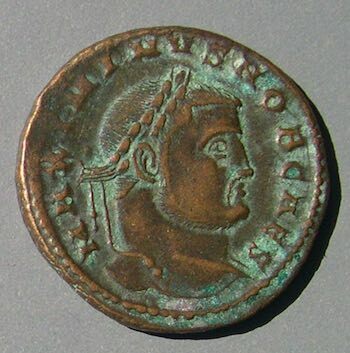 Coins with "MAXIMIANVS" in the legend are of Galerius if the legend includes "GAL" (for Galerius) as here with "GAL VAL". Recall Advice 2: Read carefully enough to distinguish between "MAXIMIANVS" and "MAXIMINVS" and Rule 1: MAXIMINVS always identifies Maximinus II. IMP C GAL VAL MAXIMIANVS PF AVG is the legend of the previous coin. Note that the long legend is identical with that of the previous coin except for the missing "A". For another pair of legends where these two emperors could be confused, see below. 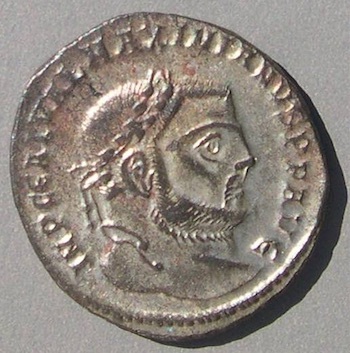 Coins of Maximian have "MAXIMIANVS" in the legend but that is not enough to identify him. His name includes "Marcus Aurelius" and Galerius's name does not, which yields Rule 4. 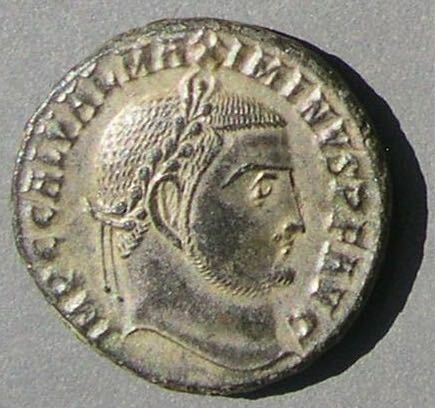 Rule 4: Coins with MA and MAXIMIANVS are of Maximian. This coin has "MA" at 9:30. 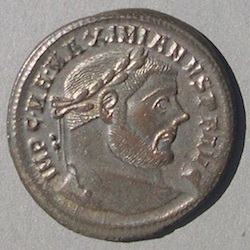 The coin is of Maximianus. 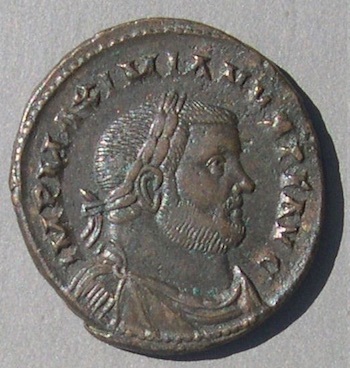 Unfortunately, many coins of Maximian do not have "MA" on them. Rule 5: Both Maximian and Galerius have coins with "MAXIMIANVS" and "AVG." We need some other way to tell them apart (sometimes the reverse type). The next legend is IMP MAXIMIANVS PF AVG (Advice 2 told us to read it carefully!) "MAXIMIANVS" makes it either Maximianus or Galerius as Augustus. The one on the left is of Maximianus as we can tell only because its reverse (not pictured here) is shared with emperors before Galerius became Augustus in 305 (and by the portrait). The coin on its right has exactly the same legend, but it is of Galerius, as we can tell because the reverse (which is different and not pictured here) is shared with later emperors after Galerius became Augustus (and by the portrait). The legend does not distinguish them! They are distinguished using a good reference work like Roman Imperial Coinage which identifies reverse types. Usually telling them apart is not so tricky. Legends of Galerius often have "GAL VAL" before "MAXIMIANVS" and are identified as Galerius by Rule 3. 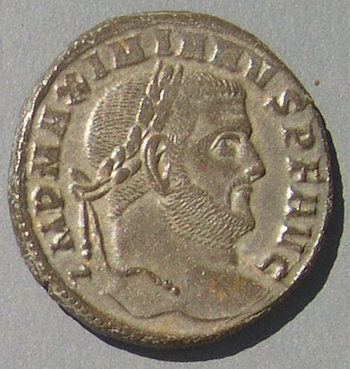 Maximian did not have "Galerius" as part of his name so his coins never have "GAL". Maximian had an upturned or bulbous nose which is a sure identifier. However, take Advice 2 ("Read carefully") because legends Maximinus II also have "GAL" and differ from those of Galerius by only a single missing A-- MAXIMINVS instead of MAXIMIANVS. You may quit here. That's all the rules. Read further only if you want to see more examples. Go to the page on portraits. Distinguishing Maximianus and Galerius. Both always have "MAXIMIANVS." 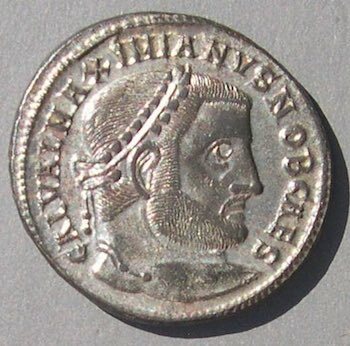 Maximianus was never Caesar, so coins with "NOB CAES" or "NOB C" cannot be of Maximian. Both coins above have "MAXIMIANVS" in their legends. The second is as Caesar (NOB CAES) and therefore is of Galerius. The one on the left is of Maximian (note the nose again). However, Galerius became Augustus in 305 so some of his coins (the later ones) are as Augustus so "AVG" does not necessarily make the coin belong to Maximian. Rule 1: MAXIMINVS always identifies Maximinus II. Next is another example of Advice 2: Read carefully enough to distinguish between "MAXIMIANVS" and "MAXIMINVS." 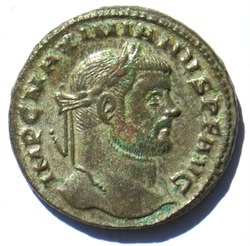 Coins with GAL VAL can be of Galerius or of Maximinus II. They are of Galerius if "MAXIMIANVS" really does have its "A", and they are of Maximinus II if it does not. The one on the left has "MAXIMIANVS NOB CAES" and is of Galerius. The one on the right has "MAXIMINVS NOB CAES" and is of Maximinus II. We know the one on the left is not Maximian (in spite of saying MAXIMIANVS) by Rule 2: MAXIMIANVS with CAES identifies Galerius. 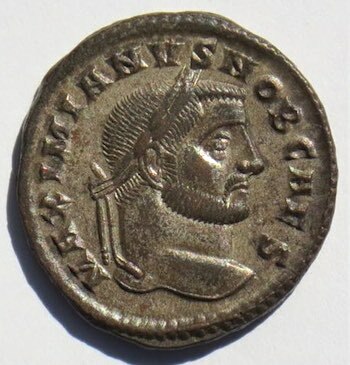 Sometimes coins of Galerius have "GAL" in the legend and coins of Maximianus never do, but many coins of Maximinus II also have "GAL" in the legend. The next legend on the left begins "GAL VAL" (Galerius Valerius) which could belong to Galerius or to Maximinus II. Which one is it? How does it differ from the one on the right? The precise spelling is important. The one on the left reads "MAXIMINVS" missing only the "A" of the one on the right spelled "MAXIMIANVS". The one on the left above is Maximinus II (after becoming Caesar in 305) by Rule 1: "MAXIMINVS always identifies Maximinus II." The one on the right is Galerius (before becoming Augustus in 305) by Rule 3: "MAXIMIANVS with GAL identifies Galerius." Return to the portrait gallery.